Major General Arnold Fields is the former U.S. Special Inspector General for Afghanistan Reconstruction and Chief of Staff of the Department of State’s Iraq Reconstruction and Management Office. He retired from the United States Marine Corps in January, 2004 after almost 35 years of active military service. At the time of his retirement, he was serving as the Deputy Commander of Marine Corps Forces in Europe. General Fields was appointed by the President of the United States in 2008 as the first Special Inspector General for Afghanistan Reconstruction (SIGAR), a congressionally mandated office. SIGAR conducts audits and investigations to promote efficiency and effectiveness of reconstruction programs and to detect and prevent waste, fraud and abuse. 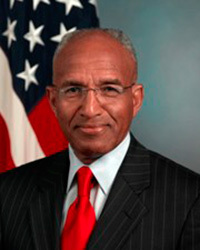 Fields had previously served as Chief of Staff of the Department of State’s Iraq Reconstruction and Management Office at the U.S. Embassy in Baghdad, Iraq. Following this assignment, he was appointed by the Deputy Secretary of Defense as Deputy Director of the Department of Defense’s Africa Center for Strategic Studies. His personal decorations include the Distinguished Service Medal; Defense Superior Service; Bronze Star Medal with Combat “V”; the Meritorious Service Medal; the Joint Service Commendation Medal; the Navy and Marine Corps Commendation Medal; the Vietnam Service Medal; and the Combat Action Ribbon. He was awarded the Department of State’s Superior Honor Award for his civilian service with the U.S. Department of State in Baghdad. He is also the recipient of South Carolina’s Order of the Palmetto, the State’s highest award presented by the governor to a civilian for exceptional leadership and service.